Add Some Coffee // Something almost magical happens when coffee is available in any environment … it makes it more relational. It slows people down from just rushing out at the end of the service. Even the big football player type guy can be intimidated to talk to other people but when he has cup of good coffee in his hand he’s comfortable to chat it up. Start a Foyer Team // Find your most out going (and not creepy!) volunteers and ask them to help “connect people” in the foyer. Charge them with “swimming” the foyer before and after your services to find people who might be just “standing around” and approach them to get to know them. 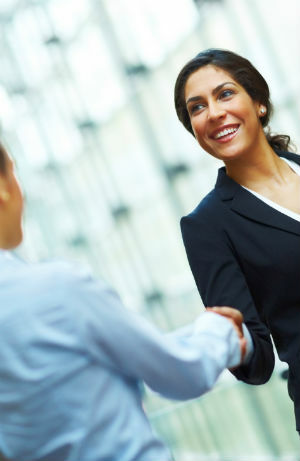 Ask them to make introductions between people … like a great party host. The key to this team is that the aren’t at some “post” to stand there and do a specific job … their role is to move around the foyer to find people to connect and welcome. Add Conversations Prompts During the Service // Why not add some fun conversation starters to your service next weekend and see what happens? Near the beginning of the service ask people to turn to someone they don’t know and answer a simple and fun question. Don’t make it too complex … something that can just spark a small conversation. Hopefully these small interactions will break the ice and make it easier to connect after the service. “New Here?” Strategy // How do you acknowledge people who are new to your church? Make sure to take time out during the service to acknowledge people who are new to your church … and give them a sense of how they can take some initial steps into community. Lots of churches offer some sort of “first time guest gift” for people when they arrive … everybody loves get a gift! Name Tags // We’ve talked about this before in a previous post entitled “5 Reasons Your Church Should Offer Name Tags Every Sunday“. Read & apply. Social … Social Media // Are you using your social media for more than just a place to spam about your latest stuff happening at your church? What if you used your social media channels to be … social? Take some pictures of volunteers and thank them with a picture on Facebook … people will get to know names and faces by seeing them online plus the volunteers will feel great. When people talk about your church online … thank them for the promotion. Ask questions on your social channels and then respond as a real person. Clear & Easy Next Steps // How easy is it for people to get onto a service team or into a small group? What could you do to make it twice as easy as it is today? Providing über clear “next steps” is critical for churches to become more relational. Every weekend people arrive at your church wanting to “get plugged in” … are you read for them when they are ready for you? (Or do you make them wait for a special time during the year?) How can you make it even clearer how people can find their place in the community? Add Play to the Service // At it’s core friendship is just shared experiences. What if you did something really fun in an upcoming service so people have some sort of shared experience? Throw out some beach balls during a high energy worship song on a long weekend. Put a mini golf set in the foyer as people arrive to play together. Hand out popcorn to highlight a message that’s going to use some movie clips to tell a point. Find something fun for your people to participate in together … and you’d be amazed the relationships that will begin to develop. I know you are are more relational than me! What are some ways you’ve made your weekend services relational? I’d love you to leave a comment and join the conversation! I like some of these ideas… Though I’m not sure our congregation is quite ready for the beach ball yet (but we are a seaside church… so who knows). We have Newcomer’s Nibbles on some Sunday’s where people who have started coming recently are invited to a finger buffet after the morning service. They’ve been quite popular and are a really good way to get to know people. Love it! Great idea. The great thing about appetizers like that … is that it pulls in a piece of a great party. Everybody loves a part with little nibbler food. Great stuff! Thanks for reading the blog and leaving a comment. You know what needs to happen in churches – teach people how to start conversations with strangers, keep conversations going, and make friends. I have visited many MANY churches (many of which employ some or all of the techniques mentioned above) which have left me feeling very unconnected as soon as the service ends – because nobody talks to you unless they’re asked to. Great idea! What have you done in your church to help people with this? How have you taught people to have conversations? Thanks for reading the blog and for commenting! Justin, I love this idea. Become more engaging through social media mediums. I never quite thought of it as you’ve described above. Hey Rich. Another great post. The “Social Media” suggestion slapped me in the face. This whole time we’ve utilized Facebook, Twitter, & Text Messages as our announcement board. WOW! Eyes open. Looking forward to sharing this with our team! Offering opportunities for people to connect in less threatening ways like service opps. People are more likely to talk to each other if they are working together on a project or an activity. I started a new way of providing meals to people in need. This required small teams of people to work together in the kitchen assembling pre made meals that would be frozen then given out to people to cook in their own homes. When I am looking at churches, I look for churches that are involved in community activities and encouraging members to join other organizations that are doing things in the community (even non-christian groups) because this is a great way to meet non-christians. I think we have to start realizing that newcomers to Sunday services are rarely non-christians, and look at how we reach out instead of expecting people to come in first. Most churches in my community offer boring services and not much living out faith activities. I think this insular focus is a big problem for the Church and only attracts consumers. Thanks for dropping by and contributing!